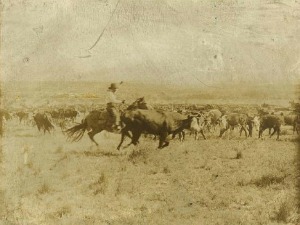 North Montague County saw millions of Texas Longhorns pass through on their way to Kansas markets on the famous Chisholm Trail from 1867 to 1887. 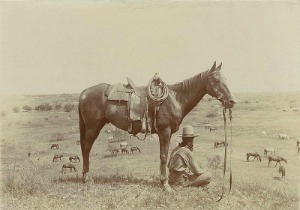 Drovers pushed cattle through the region often stopping at Red River Station, known as the North Star of the Chisholm Trail, before crossing the Red River into Indian territory. Nocona's annual Chisholm Trail Rodeo Round-Up celebrates this extraordinary history and the cowboy heritage it created. Montague County serves as home to both past and present Texas legends. Larry Mahan, six times World All Around Rodeo Champion, hails from the area and three women are members of the National Cowgirl Hall of Fame: Ruth Roach Salmon (bronc rider and trick roper for both the Buffalo Bill Wild West Show and the 101 Wild West Show), Miss Enid Justin (Nocona Boot Company Founder) and Donna Howell-Sickles (cowgirl artist from Saint Jo, Texas).